Karaoke music is trending so are the Karaoke apps. Previously, the music lovers had to sing along an instrumental track while performing at a friend’s wedding, professional event, and other places. However, gone are the days of singing along an instrumental track. Let’s welcome Karaoke apps. These are the singing apps that make you sound good. Nowadays, the complete karaokes (only the music of the original song) made available through various websites and services. You may find a bunch of them listed on YouTube as well. So, there are a variety of ways by which you can get hold of karaoke music (paid + free solutions). In this article, we are going to talk about the best karaoke apps for Android that you can make use of no matter who you are, whether a professional singer or a casual guy who just loves music. These singing apps are readily available to make you sound good while singing. The play store does house tons of applications for a variety of purposes. But, here, we do not have much quality karaoke apps for Android. Only a few of the karaoke music apps are meant to serve the purpose. While we know about that, we will not let you search for a perfect karaoke music app for hours, instead, we’ll talk about the best ones here. Yokee is one of the best karaoke apps for Android. Unfortunately, it is not completely free. While you install the karaoke app, you get certain free credits. You can utilize the available credits to make a karaoke available to use. As an added feature, it presents you with real-time lyrics as the karaoke plays along. So, in a nutshell, you have to pay in order to access the karaokes available. In either case, if you do not want to spend a penny to get karaokes to play, you can watch video advertisements in order to earn more credits that you can spend to unlock karaokes. If you are a user who can handle that kind of thing in order to get something for free, it should be the one karaoke app you’re looking at. Else, you need to opt in for a VIP package to access every feature and karaoke it houses. 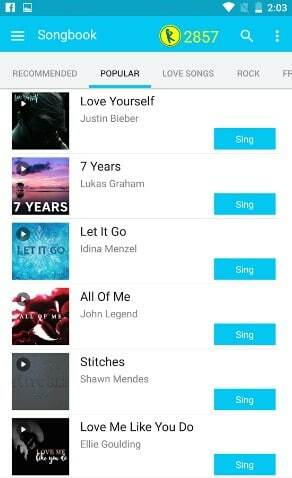 Karaoke service by Smule is a nice addition to the Play Store which is picking up its pace to become an incredibly popular karaoke app for Android. Smule currently has a lot of karaokes listed. Similar to the previous one, Smule also lets you access the karaoke music while you opt for a membership plan. However, it is definitely worth it because the karaoke music quality is just as good as the Oscars (not the same thing but surely good!). The membership plan costs you around 10 USD per year and it does offer a monthly plan as well. Smule presents a decent user interface. Also, with Smule, you get to search for karaoke music of your preferred category (filtered by genres). 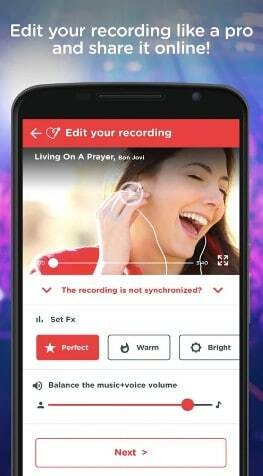 Red Karaoke is indeed one of the best karaoke apps for Android. It provides a great user experience with its beautifully tailored user interface. Unlike other karaoke applications mentioned, it lets you record both video and audio while you sing along with the karaoke. Well, the fun does not end there, you get to share your karaoke recording (with the ability to add audio effects and polish it) with the Red community. It could act as one of your opportunities to success while you get a platform to go viral easily. The output quality that you get while using this karaoke app is impressive. However, you may not find much karaoke songs through this app – meaning – it does not offer a huge database of karaoke. So, you can try it out to see if it has what you wish for. Also Read: What are the Best Equalizer Sound Booster Apps for Android to Boost Sound Quality on Android? 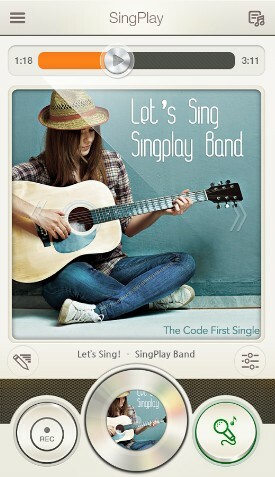 SingPlay is yet another nice karaoke app that you can install on our device. Unlike other karaoke apps, it is a karaoke maker rather offering ready-made karaoke music. 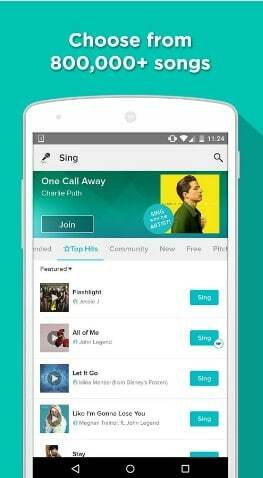 SingPlay seems to be a perfect solution to those who are not able to find the karaoke music for the desired song. Here, SingPlay removes the vocal and presents you only the music which you could utilize as the karaoke music. You just have to import an MP3 file to get started. You may not be able to make karaoke music tracks for every song, but you can definitely observe the original vocal being almost muted which most people won’t hear while you are performing using a mic. Midifun Karaoke may not be the most trending singing app at the Play Store but it surely is one of the best karaoke apps for Android. It provides a simple user interface and is easy-to-use with not much fancy options. Midifun Karaoke offers some great classic karaoke music which you could try. Unfortunately, you won’t find Bollywood songs listed (inform us through the comments if you find any!). When compared to the top karaoke music applications, Midifun fails to provide a similar quality of music. But, it’s the one you can utilize for personal parties and family celebrations but not fit for professional use. Karaoke Online is a completely different concept. And, it’s absolutely free karaoke app. 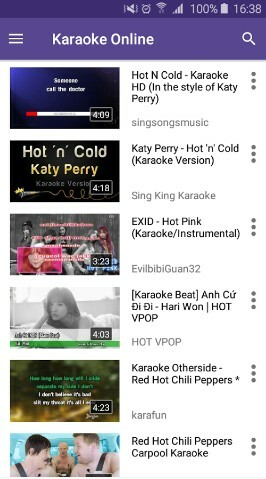 Karaoke Online utilizes YouTube’s content to fetch the karaoke music files and present only the ones within the app. It definitely saves you time compared to when you use YouTube to find karaoke music because you get all of the karaoke music listed through YouTube on this karaoke app (acts like a filter). In addition, it gives you the ability to record as well (which you will not find on YouTube official app). 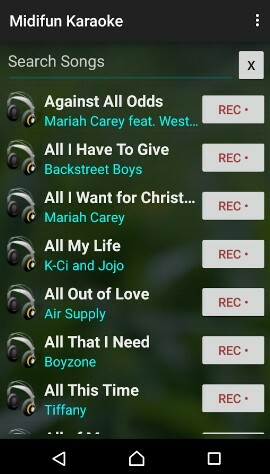 To prevent repeated searching for the same karaoke music every time you launch the app, it lets you mark the ones you like as your favorite, which you can then directly found from the favorites list. Also Read: What are the Best Music Streaming Apps for Android? Now, you know about the best karaoke apps for Android which you can utilize for personal purposes or professional purposes as well. Singing along a karaoke music is definitely a fun thing! Who knows that you might become the next singer the world awaits while you practice through these karaoke apps? If you are a social bird, you could try Red Karaoke which would suit you the best. If you want rich features and more karaoke music availability with a price, you could go for Smule or Yokee. You can also choose to experiment making your favorite karaoke through SingPlay. In either case, if you want simpler alternatives, then Midifun and Karaoke online would sit right on your couch. Let us know about your thoughts on the best karaoke apps for Android listed in this article. Also, do share your stories with us while you experienced these karaoke music applications. What are the Best Music Downloader Apps for Android? What are the Best Free MP3 Music Tag Editors for Android? How to Play Google Guitar and What are the Songs You Can Play on Google Guitar? What are the Best Music Player Apps for Android?